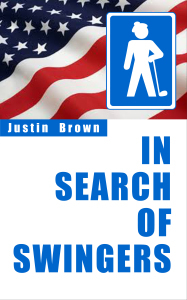 Justin Brown has the crazy idea of touring the U.S and playing golf with whoever is on the front page of the newspaper in every town he visits. With charm and wit, he blags his way into meeting clowns, Stevie Wonder impersonators, crocodile wranglers and drunken beauty queens. 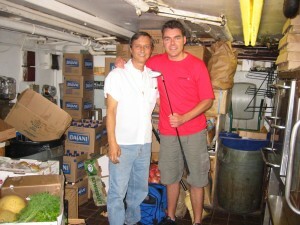 In Search Of Swingers is a journey full of mayhem, self discovery and as it turns out, very little golf. 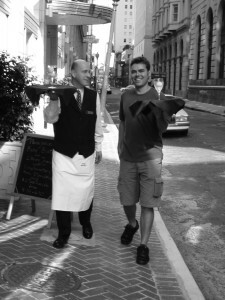 You’ll laugh and cringe at the situations this New Zealander gets into in a book that will restore your faith in mad journeys and the kindness of strangers. 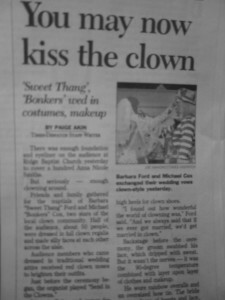 Bonkers and Sweet Thang on the front page of the Richmond Times-Dispatch. 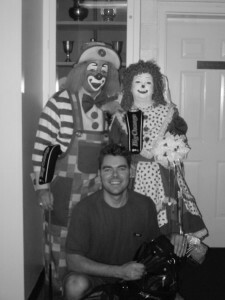 The three of us in the church at their wedding, attended by 78 other clowns in full costume. The Annual Waiters’ Race on the front page of the New Orleans Tribune. Donald Brebner (in both pics) had never picked up a golf club in his life. But he did treat me to alligator cheesecake and a five star, six course meal at Rene Bistro. 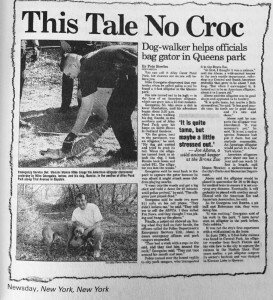 Lower Manhattan deli owner Michael Georgatos, who discovered an alligator while walking his dog in Queens Park.